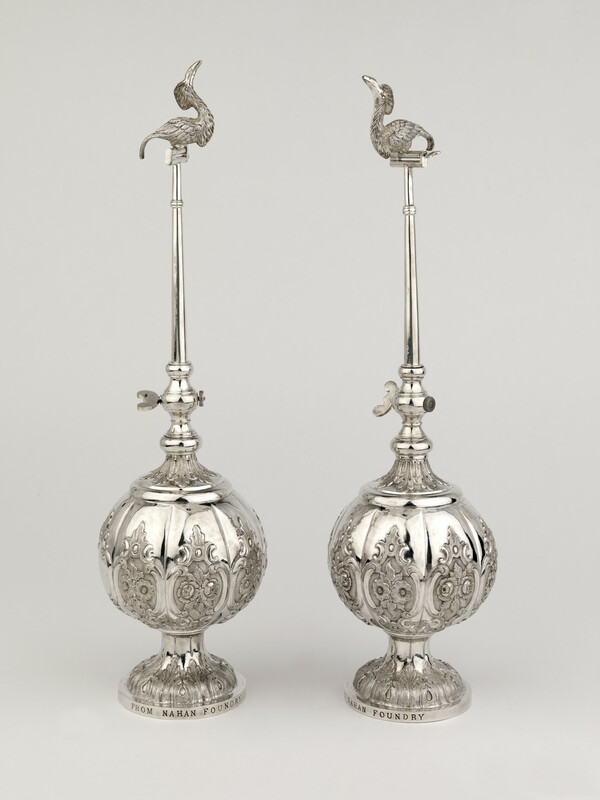 A pair of silver rosewater sprinklers or gulabpash with eight baroque-style medallions embossed and chased on the bulbous body. One of the medallions has been left blank, where a presentation inscription may have been intended. The spout of the sprinkler is surmounted by a bird and at the base is a tap with an arrangement for an air pump which does not function. The Nahan Foundry was established by Shamsher Prakash, Raja of Nahan in 1873 through an initiative with the British Government of India. The foundry produced industrial items such as sugarcane crushers and railings and was managed by an Austrian engineer, Frederick Robert Jones, which may have influenced the sprinkler's European-style decoration.